I came across this gorgeous little item in our collection the other day, and, once again, I must emphasize how I detest the art form term “decorative arts” (though not quite as badly as I detest “crafts”). There’s just no way you can look at this beautiful little utilitarian object and think “decorative!” An artist designed and made it. Remember my recommendation to see beauty in everyday objects? Well, this beautiful object comes from one of the most fascinating periods of Japanese history, the Edo Period (1603-1868). This period is very well known in the West for colored woodblock prints, but art historians know the period for the wide variety of incredible art forms produced then. The Tokugawa lords took the shogunate (“shogun” was a military leader) by force in 1603. In order to ensure that no one threatened their power, the Tokugawa rulers enacted strict policies to, in essence, freeze Japan socially. Among the many laws was one that prevented middle and lower class people from buying luxury clothing, jewelry, etc., plus a ban on travel outside of Japan. With such strict laws regulating most aspects of everyday life, Japan experienced a 250 year period of peace. With peace came an increase in demand for luxury items among the upper classes, while merchants and artists (the lowest two stations of the social order) profited from this demand. The merchants and artists spent their newfound wealth on the rich cultural atmosphere of the cities’ theater and red-light districts, as well as on personal adornment. One way around the sumptuary laws (laws restricting luxury dress) was to buy kimonos of a plain cloth on the outside, lined with luxurious, costly silk inside, out of sight. Another way was to acquire costly items such as this inro which were easily concealed. Inro, carried by noble and commoner alike, were a small series (commonly three to six) of nested boxes hanging from the kimono’s obi (sash) by a silk cord. They were made for carrying anything small such as identity seals or medicine. Much like a miniature chest of drawers, the inro boxes were held together by a silk cord that went through holes down one side, under the bottom box, and up the other side. Ogata Korin was a master painter, known primarily for his stunning six-part screens (byobu). His most famous screens usually depicted close ups of elements of nature, such as irises, cherry blossom branches, or birds, isolated on a background of gold leaf. He also worked in ceramics and lacquer. 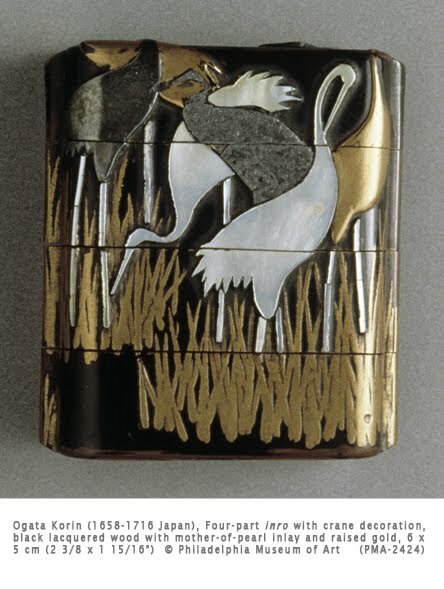 This inro is similar stylistically to many of his screen painting, with the herons isolated against the gold leaf of the rushes and black lacquer background. The blank background and simplified shapes of grass and birds create a decorative yet descriptive composition. Thank you for an informative history of the inro and for a peak at this truly beautiful example.